Launched by the American Jewish Joint Distribution Committee’s International Centre for Community Development (JDC-ICCD) and conducted by a research team at Trinity College (Hartford, CT, USA) between June and October 2011, the Second Survey of European Jewish Leaders presents the results of an online survey administered to 328 respondents in 32 countries. Conducted every three years using the same format, the survey seeks to identify trends and their evolution in time. 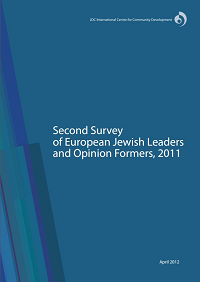 The Second Survey of European Jewish Leaders and Opinion Formers asked Jewish leaders and opinion formers a range of questions, seeking their views on the major challenges and issues concerning European Jewish communities in 2011 and their expectations for how their community’s situation would evolve over the next 5-10 years. Respondents included: executive directors and programme coordinators as well as current and former board members of Jewish organizations, rabbis from the various religious denominations, principals of Jewish schools and professionals in education, directors or owners of newspapers and publications of communal content, intellectuals, academics as well as significant community donors. Results were also analyzed in view of respondents’ age, gender, denomination and geography. The JDC International Centre for Community Development established the survey as a means to identify the priorities, sensibilities and concerns of Europe’s top Jewish leaders and opinion formers, taking into account the changes that European Jewry has gone through since 1989. In a landscape with few mechanisms that can truly gauge these phenomena, the Survey of European Jewish Leaders and Opinion Formers is an essential tool for analysis and applied research in the field of community development.